On January 18, Gateway Community Action Partnership along with Shiloh Baptist Church hosted their celebration on the life and legacy of Dr. Martin Luther King. The event was a community breakfast entitled “The Dream in Action.” WRI’s own Project Coordinator Karen Rosado attended to discuss some of the great work the Cumberland County Positive Youth Development Coalition has been doing to aid in preventing juvenile delinquency in the community. Page last updated by Senator Walter Rand Institute for Public Affairs at 9:56 am August 22, 2017 . 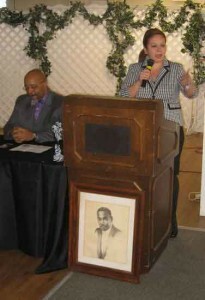 This page was printed from http://rand.camden.rutgers.edu/2016/01/27/wris-karen-rosado-attends-celebration-of-mlks-legacy/ at 4:10 PM Monday, April 22, 2019.